Marketing is at the centre of the business education boom: a million or more people worldwide are studying the subject at any one time. Yet despite widespread discontent with the intellectual standards in marketing, very little has changed over the past thirty years. 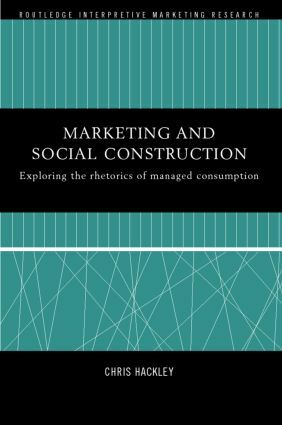 In this ground-breaking new work, Chris Hackley presents a social-constructionist critique of popular approaches to teaching, theorising and writing about marketing. Drawing on a wide range of up-to-date European and North American studies, Dr Hackley presents his argument on two levels. First, he argues that mainstream marketing's ideologically driven curriculum and research programmes, dominated by North American tradition, reproduce business school myths about the nature of practically relevant theory and the role of professional education in management fields. Second, he suggests a broadened theoretical scope and renewed critical agenda for research, theory and teaching in marketing. Intellectually rigorous yet comprehensible, this work will be of vital importance to all those interested in the future of teaching and research in business and management. Chris Hackley has studied or held academic posts at seven UK universities. His qualifications include a PhD in Marketing and a first class honours BSc in Social Science. He teaches Marketing to undergraduate and postgraduate students and researchers. His publications on marketing theory and research have appeared in British, European and American marketing and management journals.